Located within the Great Barrier Reef Marine Park, just 27km (16 miles) from Cairns, you could be enjoying this 6000 year old coral cay in as little as 45 minutes. This island paradise is the only coral cay on the Great Barrier Reef with rainforest, being home to over 120 species of plants. Green Island is also home to over 55 species of birds. The coral reef of Green Island is also home to almost 300 different varieties of coral. Green Island has long been a favourite destination for visitors to Cairns. While the island is home to an exclusive 5 star resort, it also has shady facilities for day trippers, a cafe, restaurant, dive shop and souveneir stores. There are numerous activities and attractions available such as snorkelling straight from the beach, glass bottom boat and semi submarine rides, helicopter joyflightsrainforest boardwalks and patrolled white sandy beaches. You can choose to visit Green Island for either a full or half day, with many different departure times to choose from. 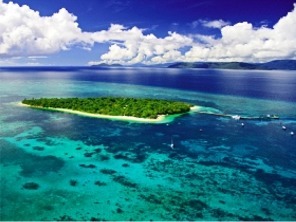 A very popular option is to combine a morning at Green Island with an afternoon at an Outer Great Barrier Reef Pontoon.